Alita: Battle Angel is set in the year 2563 after a catastrophic war known as “The Fall” has left the Earth devastated, the abandoned Alita (Rosa Salazar) is found in the scrapyard of Iron City by Ido (Christoph Waltz), a compassionate cyber-doctor who takes the unconscious cyborg Alita to his clinic. When Alita awakens, she has no memory of who she is, nor does she have any recognition of the world she finds herself in. As Alita learns to navigate her new life and the treacherous streets of Iron City, Ido tries to shield her from her mysterious past. Alita is a movie I have been anxiously looking forward to and so I scheduled it to coincide with the maiden Movies And A Drink hangout with my small movie community (which was a blast by the way). 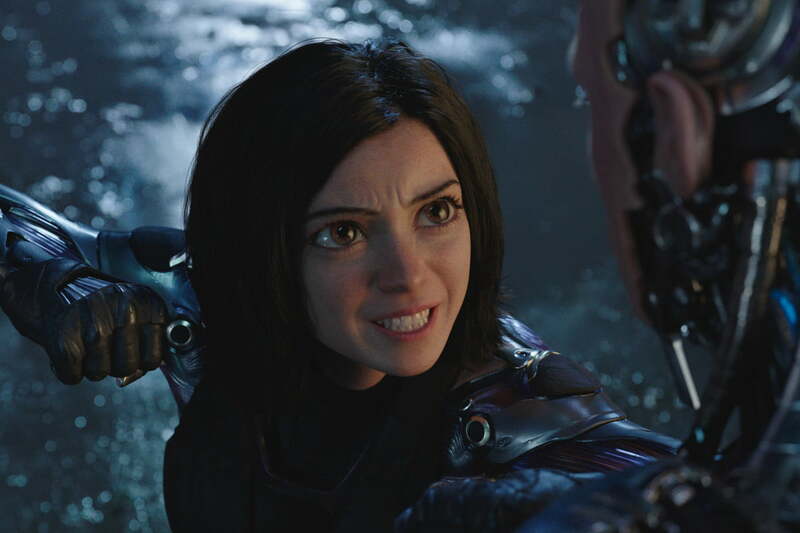 Alita turned out to be exactly what I expected it to be, and that is a visual masterpiece. As expected, a film produced by James Cameron (Avatar) and Roberto Rodriguez (Sin City) is one with ground breaking CGI and action sequences that will leave your jaw on the floor. There has been so much chatter about the eyes of Alita but I must confess that for me, that was one of the most endearing aspects of the film because it made Alita’s character more endearing and this feature stayed true to the original Yukito Kishiro manga series Gunnm. However, one predominant feature of Roberto Rodriguez’s films reared its ugly head and that is the shallow plots. Also, as expected of a Roberto Rodriguez film, the plot left much to be desired because it was quite shallow with plenty loop holes. Also, the clichés in Alita piled all the way to the roof because you see things like man vs machine romance with rogue cyborgs. Another significant flaw to Alita, is that the films conclusion can be seen from a mile away by Ray Charles and ended in an unsatisfactory manner indicating there will be a sequel. I don’t have much to say about the cast because there isn’t much to say about them as they were very underdeveloped. Alita: Battle Angel is a beautiful but hollow cyberpunk mash up of Real Steel with just a hint of Pinocchio but its visual resplendence will keep all the geeks (like moi) very entertained. I do recommend Alita: Battle Angel but with a caveat that if you aren’t into sci-fi then this may not be a film for you because you will die of boredom…probably until the action sequences come on. Thanks so much to everyone that came out to the Movies And A Drink hangout and we will be doing another one next month, so if you missed this one, don’t despair because another is scheduled when Captain Marvel comes to cinemas. PS. If you must see Alita, see it in IMAX because it’s a spectacle best savored on a huge screen.